When China announced retaliatory tariffs against Oregon hazelnuts, which were already hindered from direct access to their biggest export market by high import taxes, local farmers and processors quickly reached out to Congresswoman Suzanne Bonamici. 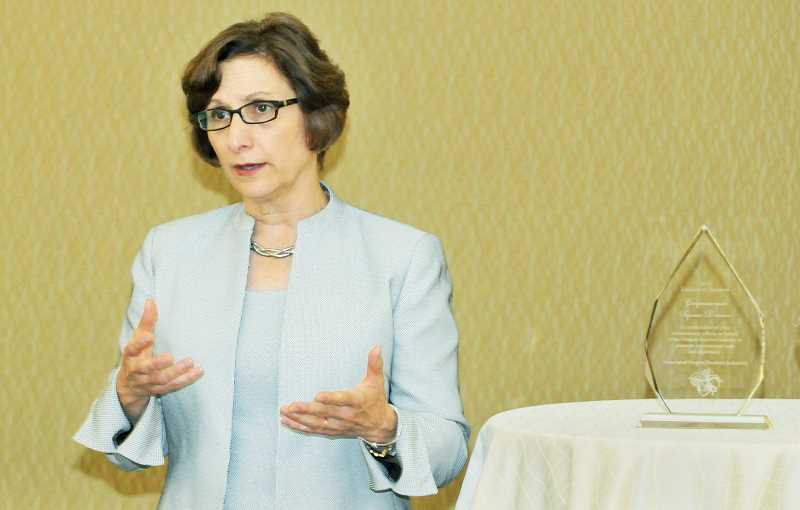 In addition to quickly lending her office's support in coordinating efforts to engage the Trump administration on the issue, Bonamici also wanted to connect more directly with those who would be hurt by the escalating trade war with China. She had that opportunity Aug. 8 at the Allison Inn and Spa, where local farmers shared their stories and, through the Associated Oregon Hazelnut Industries, honored the congresswoman with its 2018 Legislative Champion Award. "I've had several conversations with Larry George about the issue, but it really helps to hear from farmers, to hear their stories," Bonamici said. "I think it reinforced that these are family businesses and these policies, these tariffs are going to affect real families and businesses here in Yamhill County and in Oregon." George, president of George Packing Company in Newberg and former colleague of Bonamici's in the Oregon State Senate, opened up the event by updating the situation for the approximately 35 people in attendance. The state's hazelnut industry, which accounts for 99 percent of production in the United States, was already saddled with a 25 percent tariff and a 10 percent value added tax (down in recent years from 14.5 percent) before China added two more rounds of tariffs in April and August. The industry had already been forced to "trans-ship" its unshelled nuts into China through intermediary ports like Vietnam and Hong Kong, which George refers to as "gray" channels. George shared that in addition to raising tariffs, China also restricted those gray channels and that previously tariff-free nuts like almond and pistachios are now expected to clog that pipeline as well. With its normal alternative, the kernel market, severely depressed by the plunge of the Turkish lira, the hazelnut industry is preparing to be pinched when it comes time to harvest and sell. "We're able to get a few containers through right now, but it's a very, very limited volume and the price to get that product into China has almost tripled," George said. "So going into this harvest season, if we don't get a conclusion to some of these trade talks by Oct. 1, this is probably going to be a pretty painful year." While George estimated the gray channels into China will be limited to 300 containers, if the industry can manage to make eliminating or greatly reducing the tariff a part of the eventual solution to the trade war, it will be worth the short term pain. He also reported that Chinese officials have indicated being open to a 5 percent tariff, which would in turn allow direct shipping into China and a potential increase to 1,000 or more containers annually. "I am incredibly optimistic that we are making progress, especially with the congresswoman helping us push the administration on that side and we've also been working with the Chinese government," he said. Bonamici is also crafting an industry support letter to the Trump administration on behalf of Oregon's congressional delegation. "That's a big signal to the administration," George said. "The congresswoman has really gone the extra mile and has been unbelievably helpful to the industry." While Bonamici warned that it's a longshot that governmental efforts will produce results in time for harvest this year, Jeff Newton, who is the farm manager at Christensen Family Farms in McMinnville, still appreciated having the dialogue. "It's important to let her know the personal impact these things have," Newton said. "It isn't just a number on a piece of paper along with a lot of other numbers. It's a bunch of people impacted by it."